13 Art Materials Children Should Know is the latest installment to Prestel’s Children Should Know series. It joins the shelf with others such as 13 Art Techniques, 13 Art Movements, and 13 Paintings Children Should Know. The author of each installment varies. In this case Marchioro, an art instructor for kids in Italy, is the author. Having never read previous titles, or authors of the series, it is difficult to discern if something in the book is a common element shared by the series, or a reflection of the way in which the individual author has adapted their information. That being said, in this edition, there are many quirky and tangential historical topics that dance around with the progressive knowledge of art materials. It is not clear at times which is the primary focus: the history or the art materials. This slight confusion hits immediately with the title. The number 13 is a recurring theme in the Children Should Know books. However, the number in this instance seems contrived. The materials are forced into this constraint for the sole purpose of consistency to the series. There are far more than 13 art materials presented and Marchioro skirted the issue a bit by vaguely sorting the materials in 13 groups. Also, in regard to the title, no indication is made as to the role of history in the text. The back cover provides the clue, “. 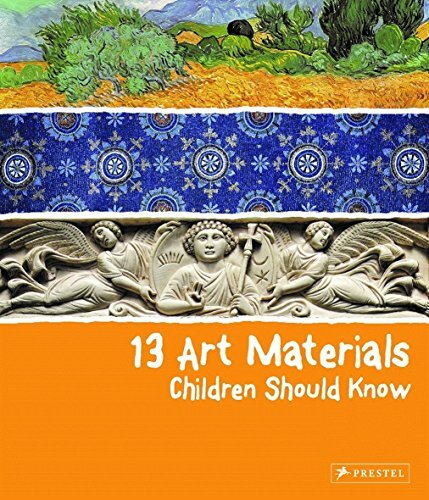 . . take a journey through art history to learn how the materials that artists use in their work have evolved over the centuries . . .” A more targeted title would be: 13 Categories of Art Materials in History Children Should Know. The book is loosely organized around these 13 categories. Outlined in a choppy graphical layout in the Contents page, the author combines materials within their historical context. Often the reader is not sure what to expect in a particular chapter. “When art celebrates power,” is a chapter heading which is about metal smithing with precious gems, and “Looking for colors,” refers to painting. Other chapter headings, “Shaping artworks with clay,” and “Wool, cotton, silk: the texture of art,” are more obvious. Information is abundant on every page. Graphical elements both help and hinder the presentation of data. On the up side, there are images representing artworks as diverse as a carved reindeer horn, a stained glass window, a woven wool tapestry. From chapter to chapter there are succinct sidebars identifying materials, tools, and date of first use in history. And there are heaps of suggestions for how curious kids can learn more by searching on the Internet should an idea serve to motivate. Credit is certainly due to the variety of ideas, details and trivia, but the disparity and inconsistency of presentation make the book feel scattered and incoherent. The use of the timeline at the start of each chapter could have been just the tool to tie in the plethora of esoteric disjointed statistics and provide grounding for the historical abstractions. Sadly these timelines are not nearly as effective as they could be. Timeline ranges vary greatly from chapter to chapter with no concrete reason. The statistics alternate between obscure facts grossly incomprehensible to the four- to seven-year-old crowd (i.e. the date of rule of the Babylonian King Hammurabi, the date of Greek civilization’s Geometric period, the date of the Fauvist art movement, etc.) and basic statistics very much relevant (i.e. the date paper was invented in China, the date of the first evidence of glass in Egypt, etc.) On studying these timelines one is bound to wonder over and over, "that’s nice to know but what has it got to do with art materials?" And this is a question that will be left unsatisfied again and again. In general this book offers a light hearted approach to its topic and is sure to have a positive impact. It will encourage kids to look at art from a perspective not often perceived. Instead of seeing how history determined art, it is suggested that art materials helped shape history. The impact that paper had on the world with the invention of the printing press is similar in scope and magnitude to the invention of the Internet and digital art. Some kids might even be able to further conclude that they themselves can have artistic and creative powers by utilizing their generation’s innovative technologies.